The Democratic Party will focus its work on the needs of citizens to provide them with better living conditions. At the same time, the DPM Governance program remains based on the Association Agreement with the EU. Statements were made yesterday by Prime Minister Pavel Filip at the New York Socialist International meeting. The first vice-president of the DPM mentioned that the party recently launched the "Pro Moldova" political platform, which wants to identify solutions to the social and economic problems of the citizens. "My plea in these complicated times is to prioritize the people, listening to their needs to make right steps in the right direction. The orientation towards people of my party, which we have transformed into a political program, is based on the objectives of ensuring peace in a difficult region", said Premier Pavel Filip. Pavel Filip also reminded about our country's steps regarding the withdrawal of Russian troops from Moldova, referring to the UN General Assembly resolution in June and the declaration adopted after the July NATO summit in Brussels. The chief of staff thanked for international support in overcoming security issues. "From an economic point of view, we no longer depend on Moscow's political control over trade, because we have diversified our ties with the West and have ensured a sustainable transition to free markets," said Prime Minister Pavel Filip. 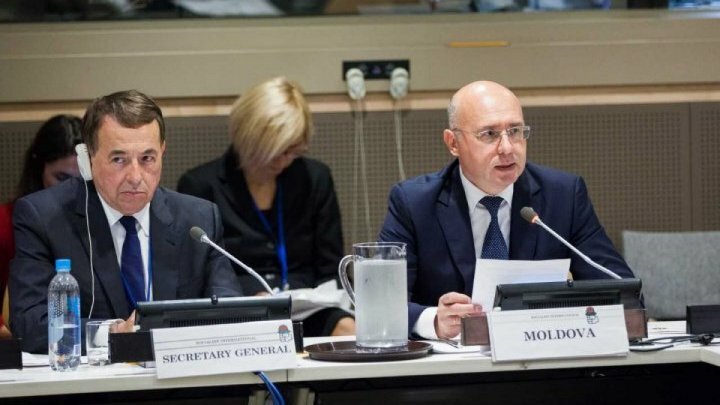 In his message, the first vice-president of the DPM spoke about the results of the partnership between the Republic of Moldova and the European Union, mentioning the positive evolution of the Moldovan economy, which increased by 4.5% in 2017 and by 5.2 in 2018. The Socialist International was established in 1951, and currently more than 150 parties in a hundred countries are part of the organization. DPM is a full member since 2012.